Hematology and Coagulation is a clear and easy-to-read presentation of core topics and detailed case studies that illustrate the application of hematopathology knowledge to everyday patient care. In order to be successful, as well as to pass the American Board of Pathology examination, all pathology residents must have a good command of hematopathology, including the challenging topics of hematology and coagulation. Hematology and Coagulation meets this challenge head on. This basic primer offers practical examples of how things function in the hematopathology clinic as well as useful lists, sample questions, and a bullet-point format ideal for quick pre-board review. This book provides only the most clinically relevant examples designed to educate senior medical students, residents and fellows and "refresh" the knowledge base, without overwhelming students, residents, and clinicians. Amer Wahed is a graduate of Medicine, training initially in Internal Medicine at Royal Postgraduate Medical School, London, England. He subsequently trained in Anatomic and Clinical Pathology from the University of Texas-Houston Medical School. After working for several years in a private setting, he joined the Department of Pathology and Laboratory Medicine at the University of Texas-Houston Health Sciences Center. Currently he is an Assistant Professor of Pathology and Laboratory Medicine and Associate Director of Clinical Chemistry and Immunology at Memorial-Hermann Hospital at the Texas Medical Center. He is also the Associate Director of the Pathology Residency Program at the University of Texas-Houston Medical School. Dr. Wahed has a strong interest in teaching and is actively involved in the education of medical students, graduate students, residents, and fellows. He has been recognized for his teaching contributions through awards from his department, as well as the Office of the Dean. He is also active in mentoring pathology residents in research and has published multiple papers in peer-reviewed journals. "At A Glance Hematology and Coagulation is a clear and easy-to-read presentation of core topics and detailed case studies that illustrate the application of hematopathology knowledge to everyday patient care. In order to be successful, as well as to pass the American Board of Pathology examination, all pathology residents must have a good command of hematopathology, including the challenging topics of hematology and coagulation. Hematology and Coagulation meets this challenge head on. This basic primer offers practical examples of how things function in the hematopathology clinic as well as useful lists, sample questions, and a bulletpoint format ideal for quick preboard review. This book provides only the most clinically relevant examples designed to educate senior medical students, residents and fellows and "refresh" the knowledge base, without overwhelming students, residents, and clinicians. 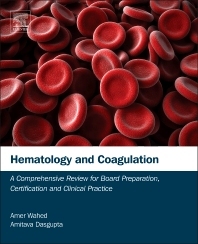 Description: This is a review of clinical hematology and coagulation concepts, principles, and practices that are assessed in the clinical pathology board exam. Purpose: The purpose is to provide a "strong foundation for students, residents and fellows embarking on the journey of mastering hematology" and to be a reference for preparation for the exam. Audience: This book was written for "students, residents and fellows." It would be of interest to any pathologist or laboratory medicine practitioner in practice wanting a quick review of the subject. It may be of interest to other medical practitioners who want to gain some insight into contemporary hematology and coagulation testing (e.g., primary care physicians, specialists, etc.). The first author is relatively new to this field, but the senior author is widely published and internationally respected in the fields of clinical chemistry and toxicology. Features: The 17 chapters cover most aspects of laboratory hematology, hematopathology, and coagulation. Each chapter follows a standard format of an introduction, explanation of standard tests/interpretations/processes, ending with a bulleted list of key points. This is a pretty comprehensive book, written in a no-frills, concise manner. I agree with the authors if the reader knows the majority of the material in this book, s/he is ready for the American Board of Pathology exam. There are no photomicrographs and only one flow cytometry figure in the book, instead readers are referred to online image banks for examples. Chapter 17, which discusses sources of error in hematology and coagulation, is relatively unique and enlightening. Experienced hematology laboratory directors would find this chapter useful.